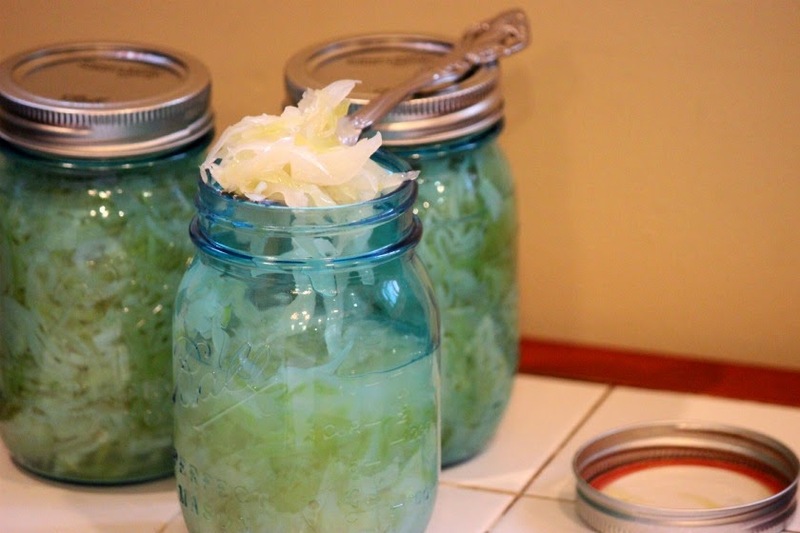 I've searched the internet for ways to make homemade sauerkraut the old-fashioned way - in a fermenting crock. Frankly, I don't have the patience to wait! It was hard enough waiting for my Naturally Fermented "Crock" Garlic Dill Pickles to be ready! 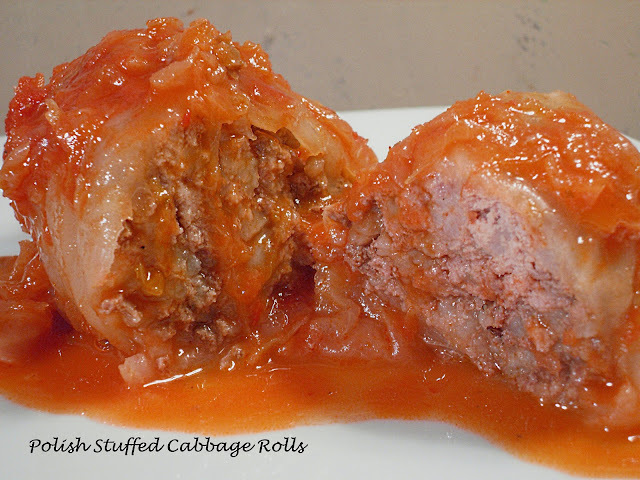 This recipe is so simple - there is some waiting time - but I think it's worth it. The kraut is not as crispy as the bagged kraut from the supermarket, but it has the same great "pucker". I've been eating this straight from the jar. You can make one jar or 50! 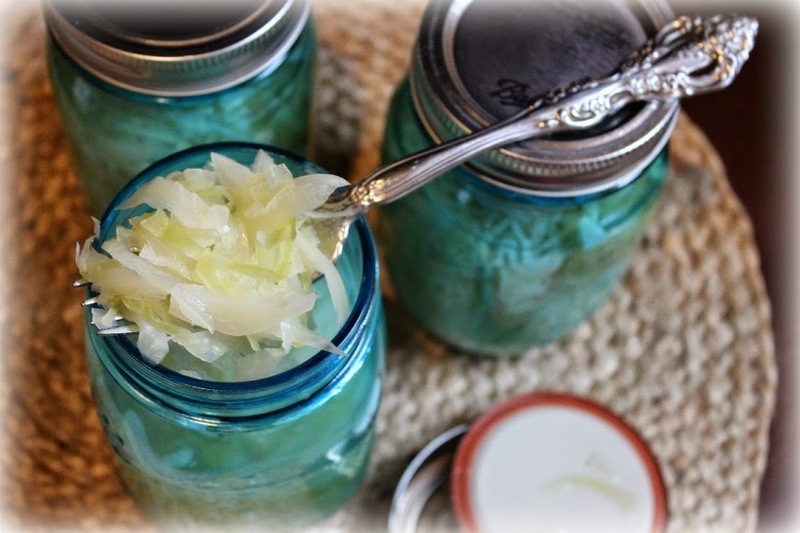 Ingredients: Cabbage Canning Salt Sugar White Vinegar Pint or Quart Ball Jars You'll want to be sure that your jars and lids are sterilized so I always begin by washing and scalding them in boiling water or run them through the dishwasher. Next, set your water on to boil. 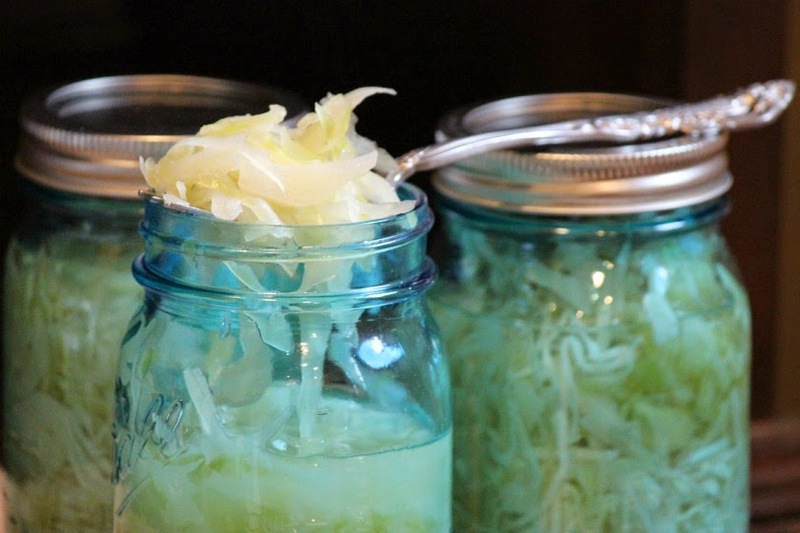 How much water you need depends on how many jars of sauerkraut you are preparing While the water is boiling, coarsely chop the cabbage. 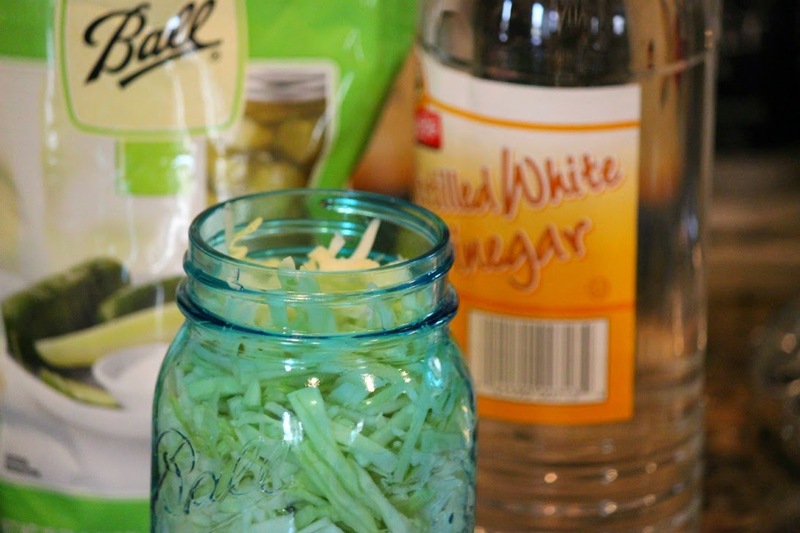 Pack the chopped cabbage into the prepared jars. You want the cabbage to be in there tight but leave an inch or two of head room. 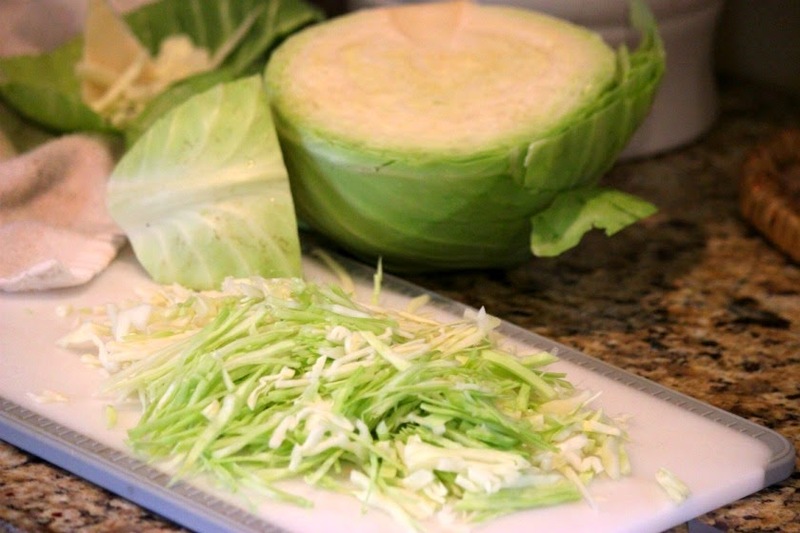 Don't pack the cabbage too tight because you need the water to filter through the cabbage. Add 1/2 tsp. canning salt, 1/2 tsp. sugar and 1 Tbsp. white vinegar to each jar. Pour boiling water into jar within 1/2" of the top. Push down cabbage with a wooden spoon to remove any air bubbles. Wipe off rim of jar with a clean, damp cloth. FOR QUART JARS, DOUBLE INGREDIENTS. Place heated lids on top of jar and seal. Place in a cool dark place for 7-14 days. Some juice may leak out of the top, but this is ok. Place the jars on a small tray if you have one. Cabbage will turn from green to a whitish-yellow. Once kraut is ready, process in water bath for 20 minutes. Kraut will be ready to eat in two weeks. 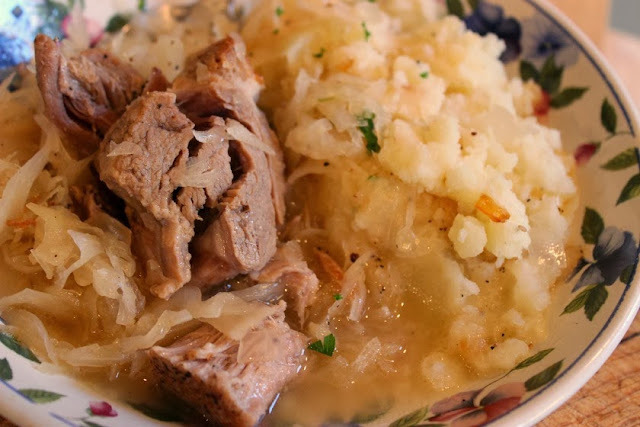 Sauerkraut is #1 on my list of things to try right after the holidays Patti! Very timely:@) Merry Christmas!